Paul Craig Roberts defines rival as “any country (able to defend) its interests or those of its allies against Washington’s hegemon(ic)” ambitions. America demands unipolar/New World Order dominance. It demands all nations bow to its will, or else! It targets independent ones for regime change. Either by coups, targeted assassinations or wars of aggression. He elevated state terrorism to an unprecedented level. He gave it new meaning. He has lots more mass slaughter and destruction in mind. He calls it “American leadership.” Others call it genocidal high crimes against peace. He’s a loose cannon. A lawless thug. A serial killer. A serial liar. A moral coward. A rogue leader. A demagogic tyrant. A modern-day Caligula. A world-class menace. He targets independent leaders. They’re not tolerated. He wants them ousted. Washington demands subservience. It wants US-friendly stooges serving its interests. Syria is in the eye of the storm. Iran’s turn awaits. Overthrowing Ukraine’s democratically elected government relates directly to targeting Moscow. America want control over all former Soviet republics and Warsaw pact countries. It wants them incorporated into NATO. It wants US bases on Russia’s borders. It wants the entire country surrounded. US pledges aren’t worth the paper they’re written on. Rogue states operate this way. America surpasses the worst in world history and then some. It wants long-range multiple nuclear warhead missiles targeting Russia’s heartland. It wants regime change. It wants Russia’s lost decade under Boris Yeltsin restored. Western governments loved him. So did media scoundrels. He was Washington’s man in Moscow. He represented “free market” gangsterism writ large. His tenure was characterized by unprecedented levels corruption, public betrayal and human misery. Another generation or more may be needed to recoup from the human wreckage he caused. During his tenure, 80% of Russian farmers went bankrupt. Around 70,000 state factories closed. Unemployment soared. It reached epidemic levels. Over half the population became impoverished. Deep poverty affected millions. A permanent underclass was created. It included unprecedented criminality, suicides, mortality, alcoholism, drug abuse, and HIV/AIDS at intolerable levels. US-instituted “shock therapy” produced economic genocide. GDP plunged 50%. Life expectancy fell. Democratic freedoms died. An oligarch class accumulated enormous wealth. It did so at the expense of millions harmed egregiously. Yeltsin let essential human needs go begging. He trashed core human and civil rights. He let corruption and criminality flourish. One scandal followed others. Money-laundering became sport. Tens of billions of stolen wealth were hidden in Western banks or offshore tax havens. Yeltsin surrounded himself with like-minded apparachiks. He used his presidency for unchallenged political power. Closed-door decisions were commonplace. Implementation was without popular consent. Washington backed them. So did corporate America. They did so to exploit former Soviet Republics’ wealth, resources and people. In August 1991, Yeltsin shelled Russia’s parliament. He disbanded it. He killed hundreds. He did so in a barrage of tank fire on Moscow streets. He imposed new constitutional authority. He governed by diktats. He usurped unlimited powers. He stripped ones legislators had. Yeltsin-style democracy mocked the real thing. His confrontations with parliament caused the October 1993 constitutional crisis. Members tried removing him from office. He hung on. He kept power. He did so until resigning on December 31, 1999. Putin replaced him. First as acting president. Then a 2000 – 2004 full term. Followed by a second until 2008. 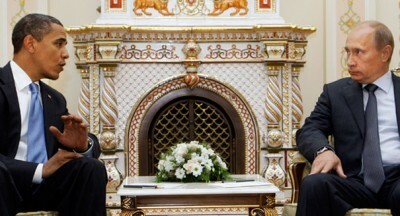 Another as Dmitry Medvedev’s premier. Then a third presidential term since March 2012. He’s overwhelmingly popular. Polls show his support at well over 80%. Russians love him for good reason. They back his steadfastness against US imperial adventurism. His support for Russian sovereignty. His unwillingness to surrender it. His commitment to preserve it. It’s not easy. He’s America’s main geopolitical enemy. Unrelenting bashing persists. Big Lies substitute for accurate reporting. No world leader in modern memory endures more malicious unjustifiable slander. None handles it better. It’s outrageous over Ukraine. Washington pounds him mercilessly. So do media scoundrels. “The entire world knows that Washington overthrew the elected Ukrainian government,” Paul Craig Roberts explained. It knows if Moscow was revanchist, it “would have kept Georgia and reincorporated it within Russia…” It would have done so after it lawlessly invaded South Ossetia. Russia intervened responsibly. It did so to protect its own citizens. It did it after about 1,700 were ruthlessly murdered in cold blood. Aggression isn’t when America ravages and destroys other countries. It’s shamelessly called liberation, humanitarian intervention, or responsibility to protect. Aggression is when Russia acts responsibly. When it protects its own people in harm’s way. When it supports near Crimean unanimity to return to Russia. When it delivers vitally needed humanitarian aid to Southeastern Ukraine. When it goes all-out to resolve Ukraine’s conflict responsibly. When it wants Obama’s war on Syria resolved the same way. When it supports Palestinian rights. When it opposes might over right. When it wages peace, not war. When it’s for multi-world polarity. When it’s against US-led NATO aggression. When it’s on the right side of history overall. Don’t expect New York Times journalism to explain. It shames the real thing. It’s a wealth, power and privilege propaganda bullhorn. Managed news misinformation and opinion substitute for accurate reporting and analysis. It’s been this way since its mid-19th century founding. It’s nicknamed “The Gray Lady.” It’s motto is “All the News That’s Fit to Print.” It’s not fit to read. Readers are systematically lied to. Vital information they need is buried. State/corporate propaganda substitutes. He wants a land bridge from mainland Russia to Crimea, Yatsenyuk claimed. He wants it expanded to Odessa and Moldova’s Transnistria breakaway region. He wants Ukraine cut off from Black Sea access, Yatsenyuk added. “We are still in a state of war and the key aggressor is the Russian Federation,” he claimed. The Times features this type rubbish regularly. It’s longstanding practice. So is double-standard hypocrisy. Whatever America does is right. Whatever its invented adversaries do is wrong. US adventurism is OK. So is destroying nations to save them. Replacing sovereign independent governments with subservient US vassal ones. Destroying democratic freedoms in the process. Extinguishing them altogether. Glorifying war in the name of peace. Serving monied interests at the expense of popular ones. Wanting control over world markets, resources and cheap labor. Wanting it at the expense of political, economic and social justice. America’s lawlessness doesn’t matter. Might over right is official policy. So is state terrorism. The divine right to kill, destroy, plunder and control. Propagandists call it American exceptionalism. Honest analysis calls it imperial lawlessness. The Times is America’s leading propaganda bullhorn. It systematically buries truth and full disclosure. Big Lies substitute. Rule of law principles don’t matter. Nor coup d’etat mob rule running Ukraine. Nor its illegitimacy. Nor anointed oligarch president Petro Poroshenko. He’s Washington’s man in Kiev. Nor his war without mercy against his own citizens. Nor his lies about Russia invading Ukraine. Irresponsibly blaming Moscow for US-supported Kiev crimes. Turning truth on its head about Russia supplying weapons to self-defense forces. Lying about it annexing Crimea. Ignoring near Crimean unanimity to return to Russia. Failing to explain international law permits it. Or that Putin acted responsibly. Supporting illegitimate sanctions. Ignoring Washington’s dirty hands running things. Doing so to advance its imperium. Targeting Russia for regime change. Wanting it balkanized into mini-states for easieer control. Wanting a major rival eliminated. Wanting its resources plundered. Wanting its people exploited. Wanting China isolated. It’s turn awaits. Obama’s former counterterrorism coordinator Daniel Benjamin called the so-called Islamic State threat a “farce.” Claiming it “spin(s) the public into a panic” irresponsibly. At stake is what Middle East populations want. The so-called Arab street. People everywhere. They want freedom to run their own lives. To determine their own futures. To choose their own leaders. Their own vision. To maintain their sovereign independence. Not what Washington demands. Not regime change when they’re not met. Not imperial wars. Not mass slaughter and destruction that follow. Not repeating it over and over again. Not making world societies safe for monied interests. Not plundering them for profit. Not making them unfit to live in. Not transforming them into dystopian wastelands. Not exploiting their people ruthlessly. Not lying about creating new democracies. Or ludicrously claiming to free “hundreds of millions of human beings…from the prison of poverty,” according to Obama. Or strengthening economies America systematically rapes, destroys and plunders. Not extolling casino capitalism exploitation. Not targeting nations for regime change. Not risking potential nuclear war with Russia. Certain Armageddon to follow. Not pursuing madness in lieu of responsible governance. Humanity’s fate hangs in the balance.